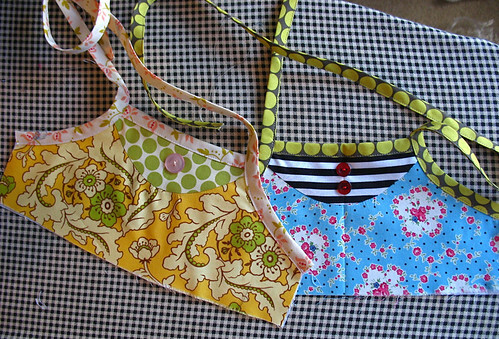 Putting ideas to fabric - Stop staring and start sewing! Drum roll please! The winner of the Trash Ties and 2 yds of Freshcut fabric is Marie!! Yippy Marie (can you believe it??)! C'mon down! Oh and 102 comments??!! A new world record (for me anyway)! I've finally had a few days to unwind and play with a new skirt pattern that I got at quilt market. I wanted to try it out before recommending it. I wore it all day yesterday and I can't wait to make more. I ordered a whole bunch and they should be in my store within a few days (hopefully I'll have some pictures to share by then too). I've had a sketch for a dress bodice sitting here that I finally got to work with and I'm really happy with the results (so far). What do you think? Guess which one Joey said was a "God-awful fabric combination". I've got another pattern idea floating in my head that I'm going to tinker with today. We've been busy tiling our master bathroom floor and I definitely feel a shower curtain/window valance vibe coming on. But for now I'm just happy to have my toilet back where it belongs.